Concrete mixing trailer pump is widely used in foundation, grouting pile, floor slab, road and site formation works, slope protection, irrigation ditches, ditch, river, Bridges, culverts, tunnels, small and medium-sized reservoirs, and so on. In order to use the trailer pump, the user must know the function, quality and service when they buy concrete pump to avoid problems. 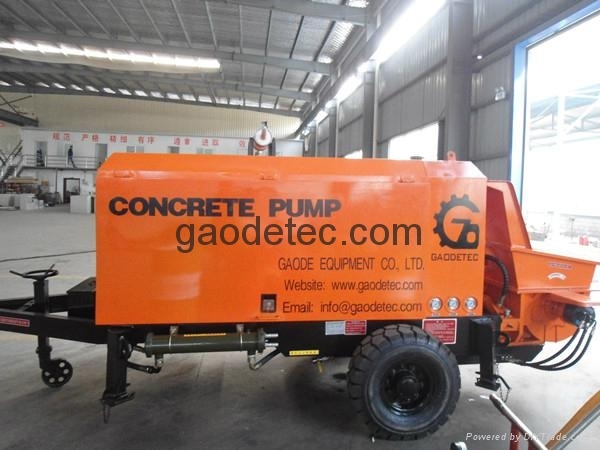 Concrete mixing trailer pump shall be subject to conditions below drag concrete pump. Kinds of parts and accessories of condition equipment should be complete as per standard equipment. Hydraulic oil and lubricating oil should be prepared in advance, the quality of hydraulic oil should meet requirement. Pouring hydraulic oil, fuel oil, lubricating oil and cold water according to requirement, and hydraulic oil is added to level required. Checking concrete pump, debugging and trial run, if the concrete mixing pump could enter into normal run, and hydraulic system should meet requirement after debugging. Pipe diameter of concrete conveying pump is 125mm for debugging used. Test concrete should meet standard. Debugging equipment should be placed on the flat and hard ground. Users should not only strictly check trailer concrete mixing pump, but also must always keep working.If so, concrete mixing trailer pump can live long, achieve perfect effect.